The first school of the district, including the village, was situated about one and three quarters miles northwest of the village. This small, wooden frame building was known as School #1. It is not known when it was built, but school was held there in 1878-1879, if not earlier. As the population in the area grew, another school, known as No. 2, was established on what is now University Street. It was located in the woods, north and across the street from the present Mound View elementary school. The two schools were consolidated and then in 1906, a four-room wooden building was erected to replace them. It was built at the location where the Middle School now is located. It was erected at a cost of $4,000.00. The teaching staff consisted of three teachers, until the tenth grade was added in 1907. At that time a fourth teacher was needed. In 1914, the four teachers were Frank Livingston, Laura Jessel, Ida (Whitcher) Jessel and Anna Halvorson. In 1920 a four year high school was organized. In 1920, a new brick school was constructed at a cost of $80,000.00, with equipment. It was located on the same site as the 1906 structure, and was the first consolidated high school in the state of Wisconsin. The first school (#1) from northwest of the village was moved to the village, to the southeast corner of the 1920 structure. It was moved by Billy Ludvigson with a stump puller, and was known as the “annex” by many of us. The teaching staff consisted of the principal, three high school and five grade teachers. Eleanor Wieland, a former teacher, remarked that in 1926, high school teachers were paid $95.00 per month and grade school teachers received less. They were required to live within the village. Michael and Lena Meyer, residents of the village, usually had four teachers boarding with them. They charged $28.00 per month for room and board. An Industrial Arts shop was added to the west end of the brick building in 1953, with Van Cartwright as the first shop teacher. A gymnasium, more classrooms and a music room were added in 1956, to the east end of the same structure. Also added were more classrooms and an office to the west end. At this time Home Economics was offered, with Mary Cartwright as the first teacher. In 1976, a new high school was completed a short distance east of the 1920 structure, on the south side of University Street. It boasts a swimming pool, an auditorium, gymnasium and all up-to-date equipment. More recently, a greenhouse and larger offices have been added. In 1993, a new elementary school was dedicated. It is located just east of the high school. The building has a large gymnasium, a library, offices, a dining hall and many classrooms. 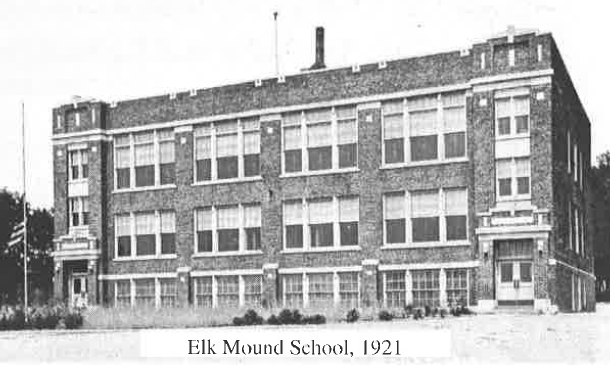 The 1920 structure was demolished in 1998, and a new middle school built between the additions on both ends, which were left untouched. Because of an overflow of students at the elementary school, beginning with the 2001-2002 school year, the middle school includes grades five, six, seven, and eight. 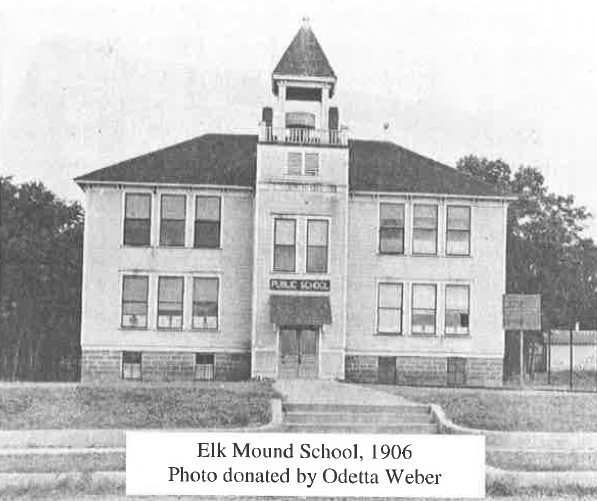 This excerpt is from the book, History of Elk Mound, by Marvin and Charlotte Cartwright. Thank You to Charlotte Cartwright for her permission to reprint this history of our school district, with edits, from her book.